Institute of Sustainable Education of the Faculty of Education and Management organise Erasmus intensive programme. 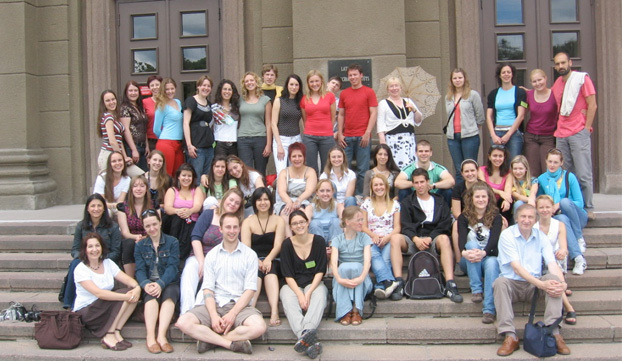 At the most torrid time that marks the end of the academic year, the Institute of Sustainable Education of the Faculty of Education and Management organises Lifelong Learning Erasmus intensive programme “Education for sustainable development: exploring hopeful pathways to preferable local and global futures”. This year the goal of the intensive programme is to integrate such disciplines as education, social work, economics, human resource management and business in studying the examples of sustainable development in both the participants’ own life and the wider society on the local and global scales. During the intensive programme, sustainability audits will be conducted in governmental and non-governmental institutions and in the social environment, creating personal and professional narratives. The programme participants are 40 bachelor, master and doctoral level students from higher education institutions of 8 project partner countries: Faculty of Education and Management of Daugavpils University, Szent István University (Hungary), University of the West of England (Great Britain), University of Porto (Portugal), PIRMAK University of Applied Sciences (Finland), University of Cyprus (Cyprus), „Vasile Goldiș” Western University of Arad (Romania) and Karadeniz Technical University (Turkey).